I’m getting pretty sick and tired of hearing the innuendo and “rumors” surrounding the supposed “bombshell” story the New York Times has been allegedly sitting on for at least a week regarding the David Paterson administration here in New York. Rumors are flying that the New York Times is set to publish a bombshell scandal regarding New York Governor David Paterson. Note the use of weasel words, “Rumors are flying.” This is in their lede. In the next paragraph, “Members of the media are abuzz about the alleged story.” Members of the media? Abuzz? Weasel words. They’re designed to provide cover for an organization trafficking in unsubstantiated and potentially libelous rumor. The Times has officially disavowed any knowledge of the story, and claims to have had no part in starting the rumor. I’m not a Paterson fan, but the treatment of this non-story (at best, it’s a story about a possible story) is beyond disgraceful. Matt Drudge has been a mainstay of the Non-Mainstream Media since he “broke” the Monica Lewinsky story on his site (after having it “leaked” to him by Newsweek, whose owners wanted to see how the story would “play” before running with it themselves). Mark Halperin (co-author of the recent political scoop-fest Game Change, which is currently on my bedside table) has apparently referred to Drudge as “the Walter Kronkite of his era,” according to his Wikipedia page. But Drudge is actually a partisan hack. I know this is not actually a shock to anyone with a modicum of intellectual honesty, but I figured an illustration from today would be apropos. Oooo! What could be going on? Well, let’s click the link and find out what the story has to say. 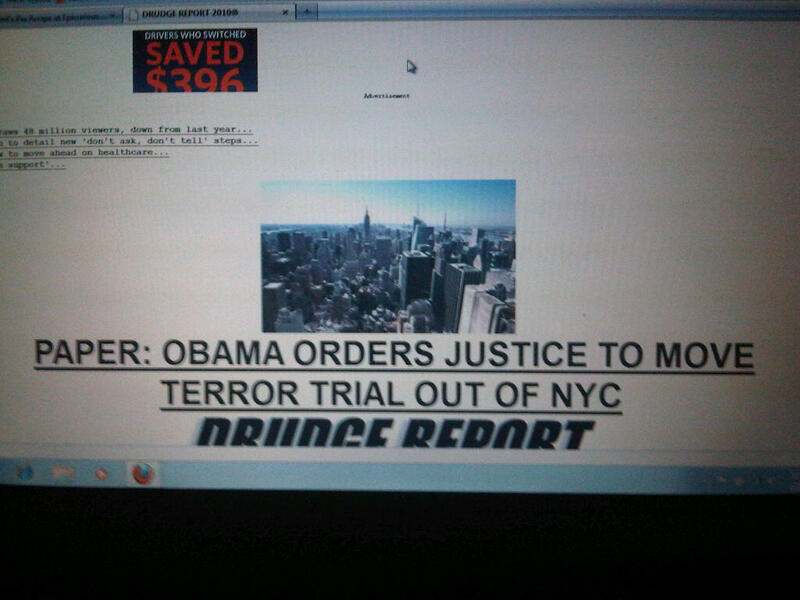 Obama must have really screwed up to be reversing himself on this New York City terror trial thing, huh? Reading the actual story — the story Drudge himself linked to — we find out that he could not have written a less-accurate headline. In the first edition of the story (which as of this writing had been updated at least once), the Daily News explained that what had actually happened was that someone from the White House had asked (a little different than “ordered”) Eric Holder’s Justice Department to “look into” the “possibility” of another venue than the federal district court in lower Manhattan. This specific verbiage is scrubbed from the “updated” version of the story (which includes more quotes from various NYC officials, a couple unnamed sources, and New York’s Sen. Chuck Schumer), but nowhere does even the new story indicate that anything other than a consideration of alternate locations is going on, or that these alternate locations are actually outside the city of New York. Drudge’s headline is misleading in almost every choice of words (other than, perhaps, “PAPER”). Let’s parse it, shall we? ORDERS — No order to move the trial has been made, simply an examination of other possible venues. JUSTICE — This is technically accurate as long as you take “Justice” as shorthand for “Justice Department,” but it’s less confusing to use “DoJ.” As it reads now, “Justice” sounds like the term for a federal judge, implying that the president has “ordered” a specific judge to move the trial, which would of course be out of order… which is exactly the implication Drudge is trying to convey. TERROR TRIAL — Can’t really fault these two words, although they’re deliberately salacious. OUT OF NYC — Again, the Justice Department isn’t necessarily considering a move out of New York City. Since Drudge isn’t really a “journalist,” per se, but merely a “news aggregator,” his job is to point people to stories. To do that, his stock in trade is headlines. In every news writing and editing class I’ve ever taken, an error in fact results in a 25-point deduction from an assignment’s score. With three glaring errors in fact in this headline, that gives Drudge a total of 25 percent for this lead item… a resounding F.
UPDATE: Well, looks like the DoJ is caving after all. That doesn’t excuse Drudge’s precipitous headline, which was still wrong at the time.